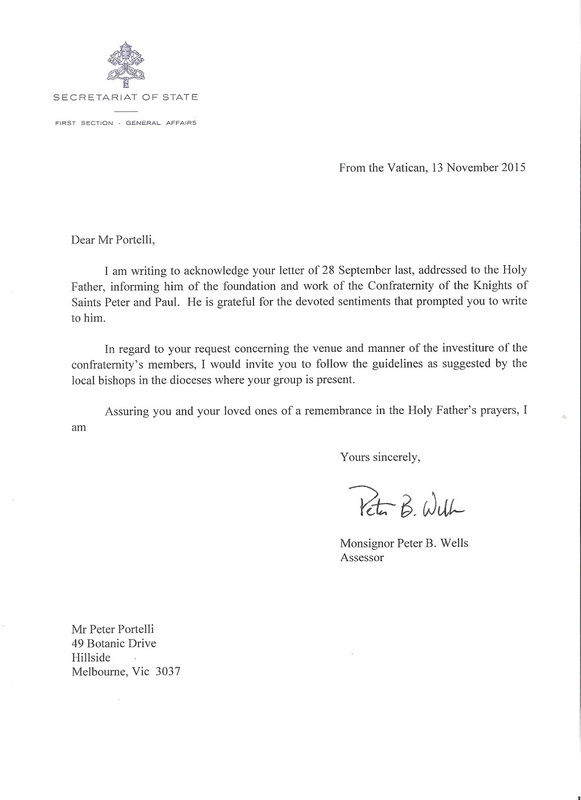 I have the pleasure to announce that His Holiness Pope Francis has read our letter of the 28 September, 2015. I would invite you to follow the guidelines as suggested by the local bishops in the dioceses where the groups is present. 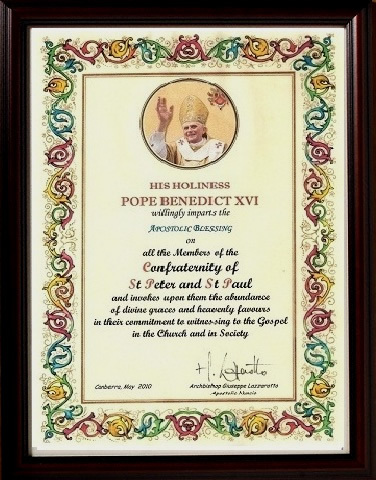 This means that the chapters must liaise with their local bishops how the investiture is conducted. Just a simple prayer and blessing of the candidates after Holy Communion in the Mass. The history book of the Confraternity is sold for $20 Australian plus postage. 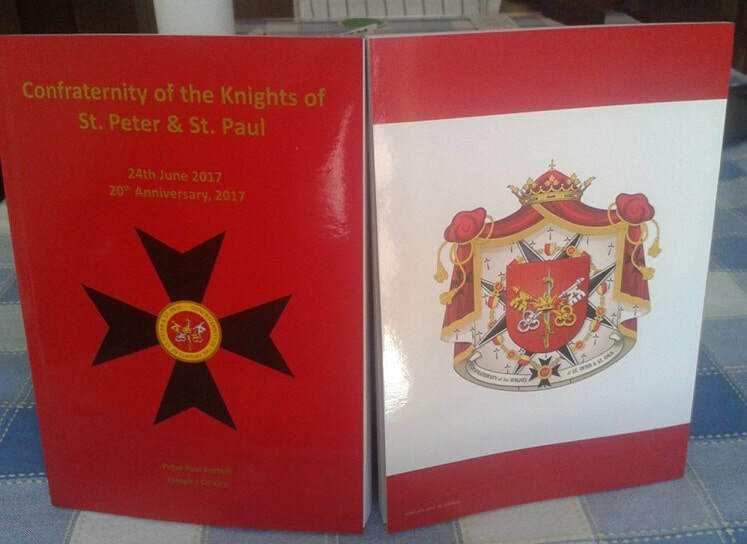 Today 25 May, 2016 a sample of the new medals of the Confraternity were given to the executive of the Supreme Council of the Knights of St. Peter & St. Paul. 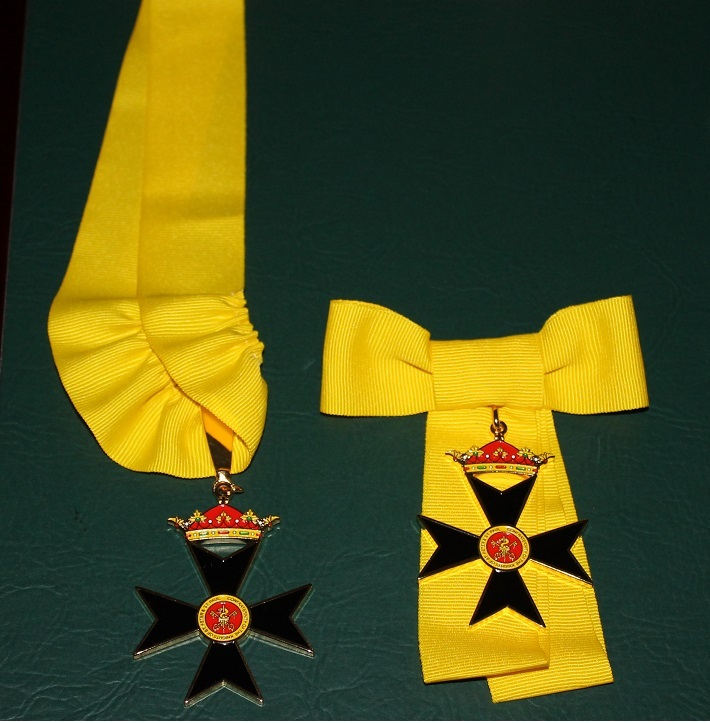 The medals were manufactured by George H Lilley of Melbourne. Proudly displaying the medals are from left: H.E. 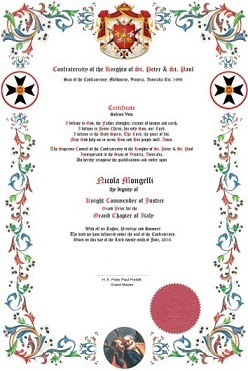 Chevalier Peter Paul Portelli - Grand Master with a link of his chain, Dame Angela Greto with the medal of the dames and Grand Chancellor Chevalier Joseph Coleiro with the knights medal. 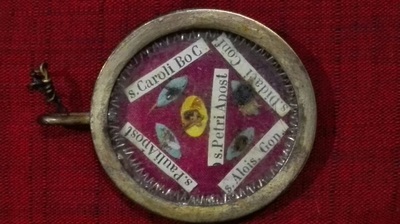 Images: The Bishop's Seal at the back of the Holy Relics. Holy Relics of St. Peter, St. Paul, St. Alois, St. Caroli and St. Didaci. ​Grand Prior Chev. 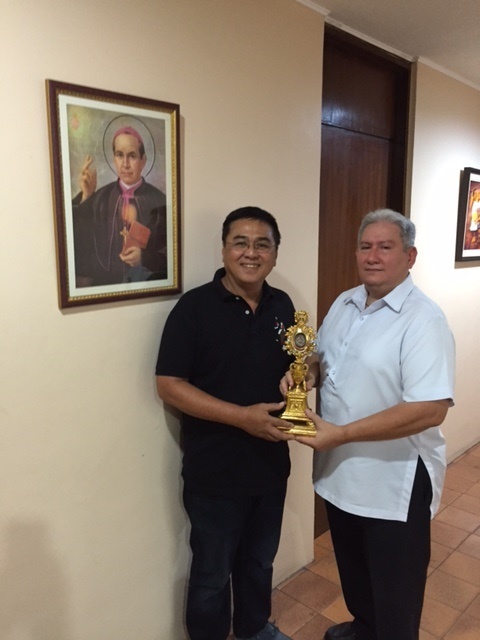 Ramon Jose Sebastia-Moreno y Ibarra is presenting the Holy Relics to Fr. Manuel Sunaz Chaplain of the Confraternity of the Grand Chapter of Melbourne. It is I who should be grateful to you and to our Confraternity for giving me the opportunity to serve. I am most humbled by this. 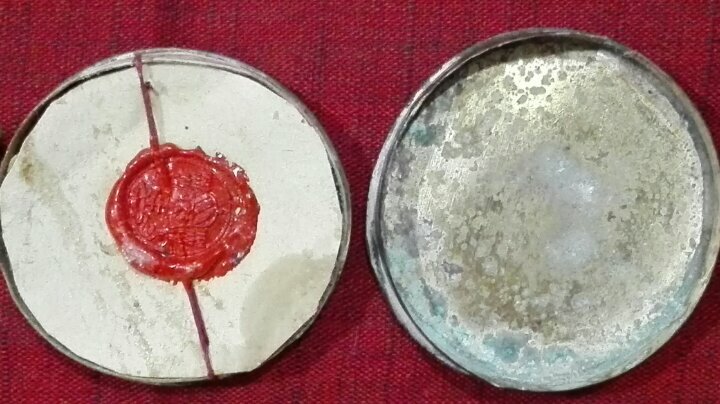 The relics I was able to obtain through the kindness of the good Franciscan Nuns, the Poor Clares of St Francis who knew I had been trying to obtain the Holy Relics for our Confraternity. We have been helping them rebuild and repair their old monastery and in gratitude obtained the Holy Relics through their Monastery in France from which Mother Superior, Mother Lina had lived and served for 30 years. I sincerely believe this is God's providence to our Confraternity for the good works we are doing. Please accept this humble gift from the Grand Chapter of the Philippines as a sign of our loyalty and commitment to you our esteemed Grand Master and to the entire Confraternity worldwide. We serve God by serving the sick and the poor. All for the glory of God through our Confraternity! God bless and preserve us! 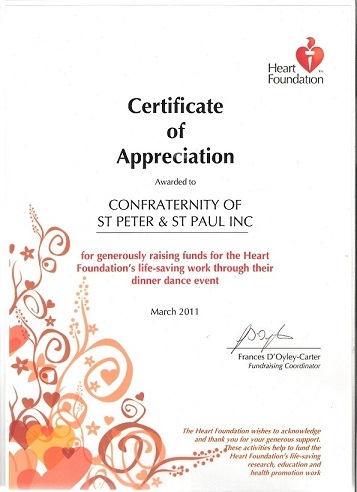 Certificate from the Royal Melbourne Children's Hospital Good Friday Appeal 2015. Woven badge of the Confraternity.